When the superheroes of the world disappeared, they left behind sidekicks and pupils, potential heroes waiting for their chance. One such student, Exemplar, decided to take matters into his own hands after Ragnarok. He fights other base raiders, the government, and anyone else who stands in his way. His self-righteousness makes him a dangerous foe because he believes he is the only true hero left in the world. Everyone else is a villain or a misguided fool. Exemplar’s parents are incredibly wealthy though and want to hire base raiders to capture him before he goes too far. Canny PCs can make quite a bit of loot by taking down this dangerous base raider. 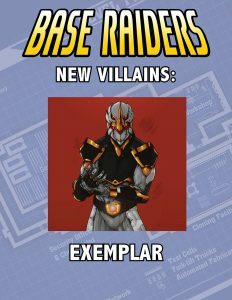 This PDF contains Exemplar’s back story, full stats, and advice on how to use him in your game. Buy the PDF for $1.79 at our web store or on DrivethruRPG.